Outside Jugiong, just as portrayed in the famous Australian folk tune, a track does actually wind back past an old fashioned shack and joins the road to Gundagai (the four-lane Hume Highway these days). The Murrumbidgee is indeed flowing and what happens to be growing, as matter of interest to me, are wild plums (Prunus domestica). 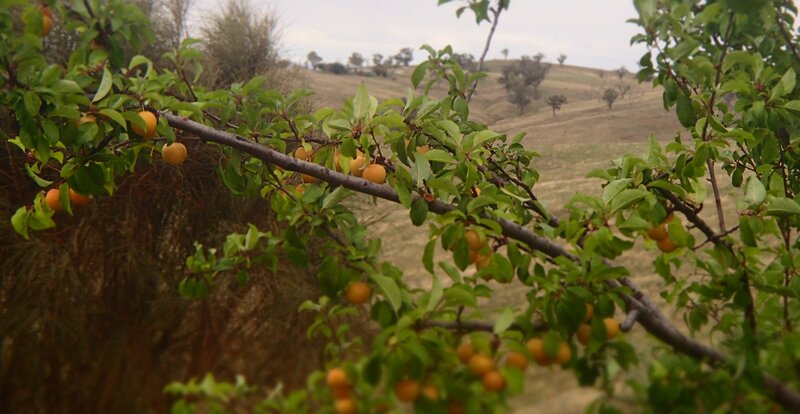 If you are on country roads along the eastern Australian range or slopes almost anywhere from New South Wales to Tasmania, January is the month for foraging wild plums. Of your common roadside fruit forages, the autumn fruits of blackberries won’t be right for another month or so and the apples perhaps another month after that. Plums are the summer thing. They can be red, yellow or something in between, or even that dark purplish burgundy like bullaces in Britain (often ripening later though). From whence they hail, among the named varieties of orchard-grown fruit, and whether from European or Asian stock, is a mystery to me; but as feral wildings, they have undoubtedly departed somewhat from domestic form. 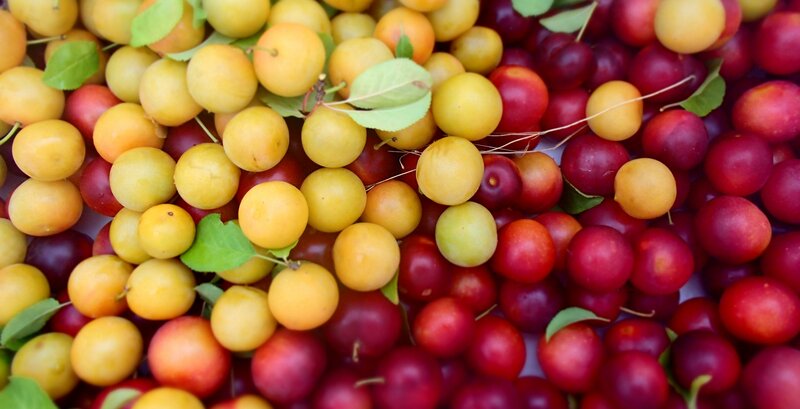 For one thing, they are a lot smaller than you might expect and you might pass them in the car thinking they are some kind of unknown inedible berry rather than the familiar drupe (botanically speaking) of the most common of stone fruits. Their prominence along roadsides suggests an initial origin as pips thrown out of passing car windows. But there are areas, like the road out of Jugiong, where their abundance suggests that they are some generations past being a travellers snack, and almost certainly instead dispersed by birds or even simply just rolling a little further down the hill from mum. With them, you can of course make a lovely plum jam, which has traditionally been my go-to response. They are pretty much like your shop-bought plum, but smaller and much more blessed with the sharp acidity in the skin which some of us love. But we are kind of full up with jams and jellies and don’t really get through that much of it anyway. So it’s plum sauce. Not the Chinese one that goes with Peking duck, but a more an Australianised British traditional stalwart of days gone by – much like the ditty Along the Road to Gundagai. This one is pretty loyal to Stephanie Alexander’s take on it. 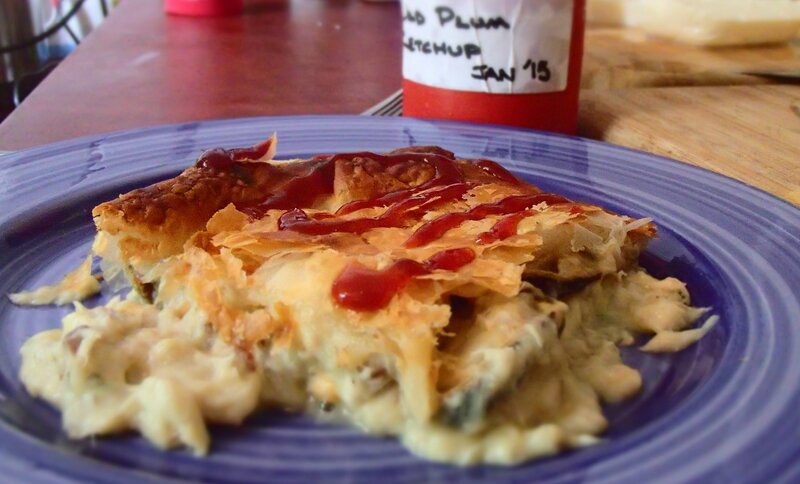 A well-tested standard recipe is worth it in this case if only to make sure you get something pourable that isn’t too runny – vary the flavours if you like, but not the solids to liquids ratio. It is a vinegar/sweet/savoury/fruit acid sauce that works as a topping for close to anything. Basically it is all that the ubiquitous tomato sauce/ketchup is, but better. Stone the plums and crack half the stones (bash with a mallet in a tea towel) and put them in a muslin bag (this give pectin to get things gelling). Tie the spices in a separate muslin bag. Put it all in a non-reactive pot and simmer for half an hour. Remove the bags, giving them a good squeeze and press the rest through a sieve, fine colander or food mill back into the rinsed pot. Simmer for as long as it takes to get the thickness you want (remembering it will thicken when cool and wants to be able to be poured like tomato ketchup). It can then go in either sterilised jars or bottles (depending on thickness). Although many would like to see such home-made delicacies in lovely glass with some neat finishes like a square of gingham cloth on top secured with a ribbon, we figure this is more an everyday kind of condiment and went for a plastic squeeze bottle (but wouldn’t do that for any stores we planned on keeping on the shelf for long).